If you have not yet ordered your Thanksgiving Turkey, consider ordering early this year. Take a moment now to learn more about the fresh organic Diestel turkeys that we feature. We are accepting reservations for whole Thanksgiving Day turkeys which are seasonal, local and free-range! Remember, once you have pre-ordered your bird, you will be able to pickup your Thanksgiving Turkey only at THE FARM STAND in Forest Knolls a few days before Thanksgiving Day. For the past 12 years Marin Community Farm Stands & CSA has brought the bounty of Marin Organic produce to the towns of Ross, San Anselmo, San Geronimo and Woodacre. 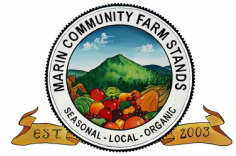 Marin Community Farm Stands represent the cooperative efforts of over 20 Marin Organic Farms from the communities of Bolinas, Point Reyes, Inverness, Nicasio, Tomales, Lagunitas and San Anselmo. The variety of their produce is a wonderful reflection of our local micro climates, and speaks of the local expertise of our family run farms. Marin Community Farm Stands & CSA brings the message of local sustainability into the community. We strive to offer the Marin County harvest but when certain staple products are not available in Marin, we go to the next closest farm within our bioregion, thereby weaving the growing communal web that unites local farmers and local tables. The impact on communities where our Farm Stands are located has been extremely low. MCFS doesn't bring in multiple trucks, vendors, or require the closing off of streets. None of this has been an issue because the Marin Community Farm Stand consists of four to six 10' x 10' canopies and 15 tables to offer a one stop shop for our customers. Delivery of the produce, which would occur in the late morning, is always swift and only involves 1 to 2 five minute stops as we manage to carpool the produce from different farms. I only need one parking spot for our refrigerated truck. You are invited to come and shop for the very finest produce & products that are seasonal, local, organic. People consider the increase in the cost of gasoline and the ever rising prices of produce and other groceries to be negative. The trend and demand for local goods in the heart of our magnificent Marin County has become noteworthy. The impact of this philosophy is far-reaching in nearly every sphere of life. It develops the local economy positively, fosters responsible stewardship of our beautiful land, and instills a sense of communion with the seasons and the farmers in our communities. We have encountered many challenges over the years to make our markets viable and have overcome these with the support of our neighboring communities.